We strive to work with you or your employees on a personal basis to ensure we are meeting your needs, your requirements and your goals. Our valued customer is our first priority! Our relationship with you is a partnership where we work together to achieve the best results. Being a small business ourselves, we understand small business concerns and limitations ... and we will work with you to resolve those concerns and work within those limitations. We believe our customer focus is our greatest strength and we will work diligently to ensure complete and total satisfaction. 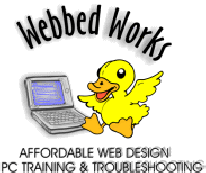 Give Webbed Works a call ... we are anxious to work with you! And we can help you launch your business or non-profit on a shoestring! Other technical services to both individuals and small organizations.